Scroll down to see the most affordable health administration degrees, as well as info on the different types of health administration degrees and health administration program accreditation. The Paul Merage School of Business at UC Irvine offers a Health Care Executive MBA (HCEMBA) for mid-career professionals. The program provides an in-depth exposure to the modern medical and health care industries and business education in a unique learning environment. The Merage HCEMBA is a recognized and highly-ranked program. Modern Healthcare has included it in its Top 30 list for Best Graduate Programs for Physician Executives (in the U.S.) for three years running (2011, 2012 & 2013). U.S. News & World Report ranked the Merage HCEMBA as Top 25 in the country in 2013. At the Labovitz School of Business & Economics at the University of Minnesota in Duluth, students pursuing their undergraduate degree (Bachelor in Business Administration or Bachelor in Accounting) or those admitted to their graduate program (Master in Business Administration) have the option of choosing Health Care Management as their field of specialization. The Health Care Management program at Labovitz provides students with a firm foundation in business as well as a broad understanding of the issues impacting the modern health care industry. These issues include comparative health care systems, medical informatics, managed care, medical sociology, legal aspects of health care, and much more. Texas A&M University offers a Master of Health Administration. This is a professional degree program designed for students who wish to pursue administrative practice in health service related professions. There are two tracks for this degree. Mid-career healthcare professionals who are already working can pursue the executive MHA track, and students beginning their careers in health administration can pursue the resident MHA track. U.S. News & World Report ranked the resident MHA track as one of the top graduate health care management programs in the country. The resident MHA track also was one of the fastest to achieve Commission on Accreditation of Healthcare Management Education. The Department of Health Policy and Management at UNC's Gillings School of Global Public Health is accredited by both the Commission on Accreditation of Healthcare Management Education (CAHME) and the Association of University Programs in Health Administration (AUPHA). Its Health Care Management Program was ranked as the #5 in the country by U.S. News & World Report (2015). The school offers a Master of Healthcare Administration (MHA) that can be pursued either on-campus or mostly online, with occasional campus visits. Joint degree programs are in place with the Kenan-Flagler Business School (MHA/MBA), the Department of City and Regional Planning (MHA/MRP) and the School of Information and Library Science (MHA/MSIS). The School of Public Health at UIC has a Master of Healthcare Administration (MHA) that is accredited by the Commission on Accreditation of Healthcare Management Education (CAHME). Students can choose to follow either a full-time or a part-time track. The school schedules some classes on Saturdays and offers some courses in the evening and online to accommodate the schedules of students who are working full-time. This is a 60-credit hour program and includes a practicum component through the MHA Preceptorship with medical centers, hospitals and long-term care centers. The school also offers a Credit Non-Degree (CND) option in Healthcare Administration. Baruch College offers a Master of Business Administration in Health Care Administration through its Zicklin School of Business. The MBA in Health Care Administration is an accelerated, part-time program designed to be completed in three years. Students must complete at least 57 credit hours of coursework, including MBA core requirements and required classes outside the core. The program is designed to prepare students for leadership positions in health care organizations by developing their analytic and decision-making skills. Students get a strong grounding in business and in the health care delivery system. A student in this program might qualify for the Marian and Melvin Prottas Scholarship, designated for graduate business students employed in the health care industry. The Master of Advanced Studies (MAS) in Leadership of Health Care Organizations at UCSD uses multiple measures to support seasoned professionals as they go back to school. Incoming students are eligible for one of the program's merit-based scholarships, which are designed to cover 25 percent of tuition. Meanwhile, those embarking upon their capstone can receive one of two Independent Study Project Scholarships, which reimburse up to $1,000 in expenses. The program has one-year, two-year and three-year curriculums to allow enrollees to either schedule around work duties or quickly finish their degree. The MAS does not receive state funding, meaning that Californians and nonresidents are quoted the same sticker price. At the University of Minnesota Twin Cities, students can pursue a Master of Healthcare Administration (MHA) at the School of Public Health. This full-time MHA program is accredited by the Commission on Accreditation of Healthcare Management Education (CAHME) and is ranked as third in the country by U.S. News & World Report in 2015. The school also offers an Executive MHA program. This program has a primarily online curriculum that gives busy executives, doctors and healthcare professionals the flexibility to complete the program in 25 months. Students in the MHA program have the option of obtaining dual degrees: MHA/MBA (Business and Healthcare Administration) and JD/MHA (Law and Healthcare Administration). Students who want to pursue a Bachelor of Science in Health Management from the University of Minnesota Crookston have the option of doing so either on-campus or online. This program has been approved by the Board of Examiners for Nursing Home Administrators (BENHA) in Minnesota, so students who plan to seek nursing home licensure after earning the degree are eligible to do so. The university maintains a close collaboration with healthcare organizations and offers internship opportunities to enhance the experiential learning experience of its students. The University of California Berkeley has a dual degree program in health management in which students earn both an MBA and a Master of Public Health. The Graduate Program in Health Management integrates the degrees to create a coherent program of study. This 80-credit program requires at least 45 units from the MBA program and 32 from the MPH. Candidates must complete at least one summer internship working with an organization such as a public health agency, health provider, medical device or pharmaceutical firm, or consulting firm. Students who intern with a community-based organization may be eligible for a $5,000 intern scholarship. This program can be completed in about two and a half years. Appalachian State University's Department of Nutrition and Healthcare Management offers a BS in Healthcare Management, as well as an undergraduate minor in healthcare management. The BS in Healthcare Management combines foundation business courses with in-depth healthcare courses to prepare students to take management and administrative roles in the healthcare industry. The undergraduate healthcare management curriculum requires 50 credit hours of major coursework, including a six-credit internship the summer after junior year, which requires at least 7.5 weeks of full-time work in a healthcare setting. ASU's Healthcare Management program is certified by the Association of University Programs in Health Administration (AUPHA). Mitchell Technical Institute has an Associate of Applied Science in Medical Office Professional that prepares students to work in medical offices in positions such as medical records technician or health information management technician, jobs that are predicted to be among the fastest growing in the country for at least the next two decades. The curriculum requires students to complete 73.5 credits, and full-time students can complete the degree in as few as four semesters. Students work a clinical internship before receiving their degree. This degree program is also offered as an online option. The Department of Political Science at St. Cloud State University offers an undergraduate certificate in health administration that prepares students to take the license examination required for managing a long-term care facility. The 38-credit program includes coursework in organizational management, nursing facility services, managerial accounting, regulatory management, information uses, human resources and gerontology. Students are also required to take a practicum course where they apply their knowledge in a community setting. Students have the option to complete the certificate on its own or in conjunction with a bachelor's degree program. CSU Long Beach offers a Bachelor of Science in Health Care Administration program that is a member of the Association of University Programs in Health Administration (AUPHA). Coursework covers a wide range of health care topics such as the legal aspects of health administration, marketing for health services organizations, principles of risk management and patient safety, and population health management for health care administrators. The Certificate in Health Care Administration can only be pursued in combination with an undergraduate degree program. The university offers a Master of Science in Health Care Administration degree that is accredited by the Commission on Accreditation of Health Management Education (CAHME). An accelerated version of this program is also available, which combines online and on-campus weekend instruction. Students pursuing a BS in Health Services Management at Western Illinois University compete with other Department of Health Sciences students for several modest awards, including the Zorn Scholarship, Taylor Memorial Scholarship and Lowell Award for Undergraduate Professionalism in Health Sciences. At the graduate level, the department offers a Health Services Administration certificate at the Macomb and Quad Cities campuses. The school's chapter of Eta Sigma Gamma, the National Professional Health Education Honor Society, is quite active, having been named the outstanding national chapter four times. The School of Health Technology and Management at Stony Brook University offers an 18 credit advanced certificate in healthcare management that can be completed on-campus, online or through a combination of on-campus and online learning. Students accepted into the certificate program must be matriculated for at least two semesters. An MS in Applied Health Informatics is available to students interested in roles as health information managers, with concentrations offered in healthcare privacy and security specialization, clinical informatics and knowledge management and leadership. An MS in Healthcare Quality and Patient Safety is also available. Ferris State University's College of Health Professions offers a BS in Healthcare Systems Administration and a BS in Health Information Management. The BS in Healthcare Systems Administration trains students for entry-level management positions in a healthcare setting and is offered in two concentrations: a general concentration and a long term care concentration. The BS in Health Information Management trains students for healthcare management roles overseeing the work of the coding, correspondence or discharge departments, and graduates of the program are eligible to write the Registered Health Information Administrator certification exam. Three scholarships are reserved specifically for students in the Health Information Management program. The Master of Health Administration at Midwestern State University has four concentrations: health information management, medical practice management, public and community sector health care management, or rural and urban hospital management. The program is designed for students who want to continue working while attending school. Part-time students can complete the degree in two to three years, and full-time students can finish in five semesters. Classes for this program are delivered online, but students are encouraged to attend optional face-to-face workshops and seminars held on campus. MWSU also has an 18-credit Graduate Certificate in Health Services Administration. The College of Public Health and Health Professionals at the University of Florida offers a Master of Health Administration program that is accredited by the Commission on Accreditation of Healthcare Management Education (CAHME). The MHA is an on-campus program that prepares students for management positions in the health care field. The college also has a Part-time MHA program that can be completed within three years (57-credit hours). Classes are held mostly on-campus with a few online courses available. The College of Public Health and Health Professionals and the College of Business Administration are offering a joint degree program that allows students to concurrently pursue a Master in Business Administration (MBA) and a Master in Health Administration (MHA). The BS in Health Science at UWSP comes in five concentrations, including Health Care Administration. A quintet of scholarships is available via the UWSP Foundation, saving beneficiaries money. Plus, incoming students with prior experience can receive credit by exam for any course, thereby lowering their time commitment. Recent department-level articulation agreements with Mid-State Technical College and Northcentral Technical College make it easier for Wisconsinites to first earn a low-cost associate degree and then transfer to UWSP. The College of Health Professions at Towson University offers a Health Care Management program through the Department of Inter-professional Health Studies. This program is one of only two undergraduate Health Care Management programs in Maryland that is accredited by the Association of University Programs in Health Administration (AUPHA). Several scholarships are available to students of AUPHA-accredited programs such as the ACMPE (American College of Medical Practice Executives) Scholarship Fund Program and the Winston Health Policy Scholarship Program. The College of Business & Economics at Towson University offers an MBA program with a Health-care Management concentration. There are several scholarships that CBE students can apply for, such as the Efat Mirmiran Endowed Scholarship (students with solid community service background) and the Moneer Hojati-Kaynama Student Scholarship (CBE international students). The College of Business Administration at UNO offers a Master of Business Administration (MBA) with Healthcare Management as the field of concentration. Students who choose this area of concentration focus on the managerial, public policy or research areas within the health care industry. At UNO's College of Public Affairs and Community Service, the Division of Continuing Studies has a Bachelor of General Studies program that offers Health Care Administration as an area of specialization. Students admitted to this program can choose to specialize in gerontology, health education or general administration, depending on their interests and professional goals. SUNY Alfred State has a Bachelor of Technology in Health Care Management that is intended for students who have already earned an associate degree in a health-related field or who have already completed at least 60 credits in a health-related subject. Applicants should have a GPA of 2.0 or higher on prior college work. All the courses for this degree-completion program are delivered online with two seven-week sessions per semester. Students take core courses to gain management skills and take electives in fields such as health care finance, human resources, and health care law. Alfred State is included in New York's new Excelsior Scholarship Program, open to families with incomes up to $100,000. The Department of Health, Recreation and Human Performance at Brigham Young University- Idaho offers a Bachelor of Science in Healthcare Administration, as well as an undergraduate minor in healthcare administration. The BS in Healthcare Administration is a 120-credit program that can be completed through in-person or online learning. The curriculum includes 49 credits of major courses in subjects like human resource management, medical ethics, medical terminology, healthcare finance and business communications. Students are also required to complete a three-credit internship. Saint Joseph's College-New York offers a BS in Health Administration, a Healthcare Management MBA, and a Management MS with a concentration in health care management. The BS in Health Administration prepares students for professional roles in the healthcare field through 18 credits of major core requirements. Undergraduate students can also apply for admission into the dual degree program in health administration and healthcare management, which allows them to complete a BS in Health Administration and an MBA in Health Care Management in shortened time frame by applying five graduate courses to both degrees. The Healthcare Management MBA is a 36-credit program offered in two concentrations: a general concentration and a health information systems concentration. The Master in Healthcare Administration (MHA) program offered at the Texas Woman's University is accredited by the Commission on Accreditation of Healthcare Management Education (CAHME). This comprehensive program prepares working professionals for management and leadership positions in the healthcare industry. Students can pursue the program on a full-time or part-time basis. TWU has a dual degree program with the University of St. Thomas. Under this program, students who are enrolled in the Health Care Administration program at TWU have the opportunity to concurrently earn a Master of Business Administration (MBA) degree from the Cameron School of Business at the University of St. Thomas. The Health Services Management Program at SUNY Polytechnic University is certified by the Association of University Programs in Health Administration (AUPHA). The HSM program combines management studies in business and health services. SUNY Polytechnic offers a Bachelor of Business Administration program with a concentration in Health Services Management. The Health Services Management concentration introduces students to important topics in modern health care such as health policy, health economics, epidemiology, health law, health financial management, and several others. SUNY Polytechnic also offers a Master of Business Administration (MBA) in Technology Management that has a concentration in Health Services Management. The Department of Health Sciences at UNCC's College of Health and Human Services has a Master of Health Administration (MHA) program that is accredited by the Commission on Accreditation of Healthcare Management Education (CAHME). The program is also a full member of the Association of University Programs in Health Administration (AUPHA). This 51 credit-hour, interdisciplinary program has courses taught by faculty from the College of Liberal Arts and Sciences, the Belk College of Business and the College of Health and Human Services. Students may enroll in the program on a full-time or part-time basis. The department has joint degree programs with the UNC Charlotte MBA and Professional Science Masters in Health Informatics programs and the Charlotte School of Law's JD program. Northeast Community College offers an Associate of Applied Science in Health Information Management Systems that teaches students to collect, store, process, retrieve, analyze, disseminate, and communicate information in hospitals, clinics, nursing facilities, health insurance companies and government agencies. The 68-credit program includes 19 core courses in subjects like health information management, coding, statistics, medical billing, medical terminology, pharmacology and health care information systems. Core requirements also include a three-credit professional practice experience. Additionally, students have to complete general education requirements in behavioral science, oral and written communication, mathematics, science and technology, and social science. The School of Management at the Sage Colleges offers a Master of Science in Health Services Administration that prepares students for administrative and management positions in health care organizations such as hospitals, hospices, nursing homes, health insurance companies, and government regulatory agencies. The program is offered in face-to-face classes at Sage in Saratoga and also online. The Saratoga program offers a specialization track in dietetics and offers a research or non-research option. In the online format, the classes are delivered asynchronously and students cannot select a research option. Required classes cover topics such as legal aspects, budgeting, health finance, program analysis, comparative health systems, and management information systems. Students are also required to have an externship or internship. The School of Public Health at the University of North Texas offers a Master of Health Administration Program. The goal of the program is to prepare students to effectively manage and lead and to assist in the improvement of health care and health services. Students in the program will take courses such as Health Politics and Policy, Principles of Epidemiology, MHA Professional & Academic Development, Seminar in Health Care Management, Health Services Management, and Health Economics. The program is accredited by the Council on Education for Public Health, the Commission on Accreditation Healthcare Management Education, and Southern Association of Colleges and Schools, among others. The Bachelor of Science in Health Administration degree offered at CSUN is certified by the Association of University Programs in Health Administration (AUPHA). The curriculum includes coursework in health law, financial planning and reimbursement in healthcare, leadership and direction in the administration of health services, and computer application in health sciences. There is also a Master of Science in Health Administration program available. Students have the option of writing a thesis or taking a comprehensive exam as their culminating MS activity. CSUN offers a post-graduate Health Administration Certificate through the Tseng College. This program offers specializations in national health administration or international health administration. Qualified full-time undergraduates enrolled in the program may be considered for the Health Administration Scholarship Program ($500). The Beacom School of Business at the University of South Dakota offers a Bachelor of Business Administration degree with a major in health services administration. The program is certified by the Association of University Programs in Health Administration (AUPHA). Students are required to complete 51 hours in the major in addition to a pre-major business core. Coursework includes a wide range of business and health administration topics such as business statistics, information systems for business professionals, health services management and epidemiology, and gerontology and long term care. Several courses are available online, while some are offered only during the fall or spring semester. Students pursuing a Master of Business Administration degree can choose health services administration as their area of specialization. The Naveen Jindal School of Management at the University of Texas Dallas has a Bachelor of Science in Healthcare Management (BSHM) program. Eligible undergraduates can apply for a Fast-Track Program that lets them earn both a Bachelor of Science and a Master of Science degrees in Healthcare Management in as few as five years. Physicians who are in (or preparing to move into) leadership roles in their healthcare organizations may be eligible for the Alliance MS/MBA program. Individuals who complete this program earn two degrees - a Master of Science in Healthcare Management and a Healthcare Management Executive MBA. This program is accredited by the Accreditation Council for Continuing Medical Education and by the Association to Advance Collegiate Schools of Business. The University of Wisconsin-Eau Claire offers a bachelor's degree in health care administration. Graduates of this program often become administrator and leaders of organizations such as hospices, outpatient clinics, assisted living facilities, and group homes. They are prepared for many different positions such as pharmaceutical salesperson, nursing home administrator, marketing manager, HMO underwriter, health care consultant, and human resources director. Health care administration students participate in a practicum, which consists of 50 weeks at an affiliated health care facility. This allows students a way to gain experience in a real world setting. The Richard M. Fairbanks School of Public Health offers health administration programs that are accredited by the Commission on Accreditation of Healthcare Management Education (CAHME). The Bachelor of Science in Health Services Management (BSHSM) trains students to develop and implement policies that improve the delivery of health services across a wide population spectrum. The school also offers a Master of Health Administration (MHA) degree. Qualified BSHSM students can apply for early admission to the MHA program and reduce the time it would take for them to complete both degrees. Joint degree programs are offered in law (MPA/JD) and in business (MPA/MBA). Graduate certificates in health systems management and Doctor of Philosophy degrees in health policy & management are also available. The School of Planning and Public Policy at Rutgers University offers a Bachelor of Science in Health Administration with an optional concentration in long-term care. The B.S. in Health Administration consists of 49 credits of major requirements, including coursework in subjects like health care systems, writing for professionals, health care economics, health care law and ethics, health care marketing, research methods and financial management. Students are also required to complete a three-credit leadership seminar and a six-credit internship. Students who choose to specialize their studies in long-term care complete an additional three courses that teach them about public health, aging and long-term care management, including an internship in a long-term care setting. Students who complete the concentration are eligible to take the New Jersey State Nursing Home Administrator Licensing Exam. Students accepted to the Master of Health Sciences program at the College of Health and Human Sciences at Western Carolina University have the option of selecting health management as their area of concentration. This is a 33-semester-hour program that is available online. The curriculum includes courses that cover a wide range of relevant topics such as health care informatics, Medicare and Medicaid, leadership strategies, health care marketing, and quality performance. Students with an interest in a particular health management aspect that is not supported by the current curriculum can take an independent study in health sciences course with the approval of their advisor. Students can either complete a research project or write a thesis in order to graduate from the program. The College of Business at the University of Texas in Arlington offers a Master of Science in Health Care Administration (MS HCAD) program. This is an accelerated cohort-based program that is designed so that students can complete the program in 24 months. Required courses include accounting, economics, financial management, healthcare quality assessment, legal issues in healthcare management, marketing management, and strategic management. UTA's College of Business has an integrated degree program with the College of Science, whereby students admitted to the MS HCAD program can concurrently pursue a degree in Bachelor of Science in Biology (BIOL/HCAD). This five-year program is designed to help prepare students for a career in health care administration, medical school or advanced study. West Texas A&M University offers a Master of Business Administration program with an emphasis in health care management. Students who wish to be considered for this emphasis must have at least two years of professional experience in the health care space or in a related field. The curriculum includes courses in the legal aspects of health care, economics of health and medical care, financial management of health care, business communication for health care managers, health care marketing and public relations, and planning for IT in health care. The university's MBA degree is a 31-49 credit program that is designed to be completed in two years. Students have the option of taking the required courses on campus in the evenings or asynchronously online. The College of Health and Public Affairs at the University of Central Florida offers a Bachelor of Science in Health Services Administration through the Department of Health Management and Informatics. The program is certified by the Association of University Programs in Health Administration (AUPHA). Although pre-requisite courses as well as general education courses are not always available online, the core courses for the BS in Health Services Administration program are offered both online and on campus. The curriculum includes coursework in the following: health care law and ethics, medical terminology, health care economics, principles of managed care, community health, U.S. health care systems, and epidemiology. Students are required to complete an internship experience in order to graduate from the program. The College of Public Health at USF offers a Master of Health Administration (MHA) degree from the Department of Health Policy and Management. Students also have the option of concurrently pursuing a dual degree - a Master of Health Administration and a Master of Health Policy (MHA/MPH). The college has a Graduate Certificate in Health Management and Leadership that is designed for students who wish to pursue management and leadership positions in the healthcare field. The College of Public Health at the USF is accredited by the Commission on Accreditation of Healthcare Management Education (CAHME). The Brooks College of Health at the University of North Florida offers a Bachelor of Health Administration (BHA) degree that is certified by the Association of University Programs in Health Administration (AUPHA). Students are required to complete an internship program in order to earn their BHA degree. A Master in Health Administration (MHA) program is also available. This program is accredited by the Council on the Accreditation of Health Management Education (CAHME). MHA students have to take 48 credits in the major, which include courses such as health care organization and delivery, managerial epidemiology, health information technology, and advanced health care financial management. There are a number of scholarship opportunities for MHA students including the Foster G. McGraw Graduate Student Scholarship ($5,000). The Business School at the University of Colorado in Denver offers a Master of Science in Health Administration degree. Students accepted to the program follow a curriculum that covers a wide range of relevant topics including healthcare financial management, quality and process improvement, legal and ethical environment of business, and applied economics for managers. Courses are available both on campus and online, giving students a considerable amount of flexibility in scheduling their classes and earning their degree. UC Denver also offers a Master of Business Administration program that allows students to specialize in health administration. Both programs are accredited by the Commission on Accreditation of Healthcare Management Education (CAHME) and are the only accredited health administration programs in the Rocky Mountain area. Health administrators handle the business side of health care management. They work as CEOs and hospital heads, medical coders and office receptionists. They find careers in community clinics, insurance companies, government agencies, medical centers, nursing homes and hospitals. As baby boomers age and health care facilities expand, opportunities in this field continue to grow. Interested? 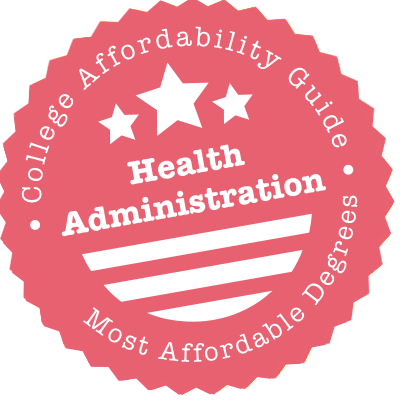 Take a look at our guide to affordable health administration degrees. In it, you’ll find everything you need to know about degree options, important accreditations, licensure requirements and professional certifications. Considering distance learning? An associate’s degree in health administration is a 2-year degree that can be used for entry-level jobs or as preparation for earning a bachelor’s degree. Associate-level degrees are often offered by community colleges. This degree is intended to help you get a foot in the door. For example, AAS graduates might handle administrative work in a doctor’s office, organize patient’s records in a hospital, code for insurance billing or manage pharmacy inventory. Associate of Applied Science (AAS) in Health Administration: Intended for students who wish to work straight after graduation. The AAS is a terminal degree – credits will not carry over to a bachelor’s degree. Associate of Arts (AA) in Health Administration: Intended for students considering a bachelor’s degree. Includes liberal arts courses (e.g. foreign language, English, sociology, etc.). Associate of Science (AS) in Health Administration: Intended for students considering a bachelor’s degree. Includes science and pre-med courses (e.g. biology, chemistry, etc.). Depending on the program, you may be able to choose a degree with a general track (e.g. courses in business administration, marketing, etc.) or a career-related concentration (e.g. medical records, pharmacy practice, etc.). A bachelor’s degree in health administration is a 4-year program that provides a thorough grounding in health services management. In addition to learning about important concepts (e.g. medical law), you will acquire practical administrative and analytical skills. A BS or BA is the standard starting degree for the profession; students interested in management opportunities often opt to add a master’s degree. Anxious to attend a respected undergraduate program? Look for AUPHA certification. Bachelor of Arts (BA) in Health Administration: Typical option for those interested in administration and management. Includes liberal arts and business courses. Bachelor of Science (BS) in Health Administration: Typical option for those with clinical and technical goals. Includes science and medical courses. Many schools also offer concentrations in a particular area of health care administration (e.g. finance and insurance, policy development, emergency management, etc.). Employers favor BA or BS candidates with real-world experience. Always check to see if your program provides volunteer/internship opportunities with healthcare providers. Unlike the general MBA, a master’s degree in health administration focuses on leadership and business skills as they relate to health care. Offered by schools of Public Health, Business, Allied Health (and sometimes Medicine), this degree takes around 2 full-time years to complete. The MHA is deliberately designed for students interested in senior management and planning positions (e.g. managing a department, running a hospital, working in public health leadership, etc.). To apply, you must hold a bachelor’s degree and may be expected to have some professional experience. Keen on attending a program with a great reputation? Look for CAHME accreditation. Master of Health Administration (MHA): Curriculum may be focused on health care administration from the start. Master of Business Administration (MBA) in Health Care Administration: Curriculum may start with a general management core before focusing on health care. Master of Health Services Administration (MHSA): Curriculum may be focused more on public health than private health care. Master of Public Health (MPH): Curriculum is focused on public health and policy issues. For many employers, there is no significant difference between the MHA and MHSA. Titles are often used interchangeably. Since each master’s program is unique, we recommend you check with universities and employers to see which degree would be best for your situation. Most schools also offer career-focused concentrations (e.g. operations management, gerontology, health information management (HIM), policy development, etc.). You may be required to write a dissertation and/or complete a capstone project in order to graduate. Because this is a professional degree, it’s important to search for programs that provide quality internships, supervised work experience, postgraduate fellowships and/or residencies. Note: You can read more advice about choosing a graduate program in ACHE’s article, “Which degree should I pursue?”. With an accelerated degree, course credits count towards both baccalaureate and master’s programs. This is a faster and cheaper way to earn your bachelor’s and master’s degrees. Executive degrees are tailored to health care administrators with significant work experience. As such, these part-time programs tend to focus on senior leadership skills. Classes are offered at night, on the weekend and/or online. You may also be required to complete a capstone project. Dual degrees can be completed in less time (e.g. 2-3 years) than it takes to earn two degrees sequentially. A doctoral degree in health administration is an intense 3-5 year program focused on advanced research in health care administration. It’s the highest you can go in your education. Graduates work as university professors, policy experts, researchers and executives. A PhD or DrPH is not required for management positions. For those jobs, employers are happy to see the MHA or MHSA. Doctor of Philosophy (PhD) in Health Administration: Academic degree with a focus on generating original research. Intended for university academics and researchers. A dissertation is required. Doctor of Health Administration (DHA): Professional degree with a practical focus on applied research. Intended for working administrators who wish to use existing ideas in a constructive way. Doctoral programs require students to take theoretical courses and complete a practical research component (e.g. project in a particular health care facility). You may also be able to choose from a variety of concentrations (e.g. policy development, public health, information systems, etc.). Note: Trying to save money? Some schools offer combined MHA/PhD programs. Certificates are non-degree, academic programs that you can use to earn course credits, build skills (e.g. research administration, medical records, etc. ), prepare for professional certification or advance your management career. Working full-time, certificates usually take 6 months – 1 year to complete. Although certificates in health administration are available at the undergraduate level, you’ll find the most choice at the graduate level. To accommodate working professionals, many graduate certificate courses are offered online. However, you may be required to complete an internship or capstone project. When considering schools, we recommend you choose a regionally-accredited college or university. Regional accreditation is a “seal of approval” granted to institutions by one of six regional bodies (e.g. North Central Association of Colleges and Schools). Bachelor’s degree candidates will also want to look for AUPHA certification; master’s degree candidates should look for CAHME accreditation. The Association of University Programs in Health Administration (AUPHA) certifies baccalaureate programs with a focus in health care management. Like CAHME accreditation for masters’ programs, AUPHA certification tells you (and your future employers) that your degree meets a set of rigorous standards. For example, any student in an AUPHA-certified program must complete an extensive internship in a health care setting. Note: Be sure that the program is certifed by AUPHA, and is not just a member. The Commission on Accreditation of Healthcare Management Education (CAHME) is the only accrediting body recognized by the U.S. Department of Education for master’s programs in health care administration (e.g. MHA, MBA, MPH, etc.). CAHME also accredits dual degree programs. Baccalaureate certification is handled by AUPHA. CAHME accreditation is the gold standard for graduate health administration degrees. You’re likely to have more success in finding fellowships, impressing employers and getting job interviews if you choose a CAHME-accredited program. One thing to bear in mind – CAHME does not accredit 100% online programs. CAHME says it’s impossible for students of these programs to be exposed to core competencies like teamwork, leadership and collaboration. However, CAHME does accredit hybrid programs with online components. Note: Be sure that the program is accredited by CAHME, and is not just a member. The Commission on Accreditation for Health Informatics and Information Management Education (CAHIIM) accredits associate and baccalaureate degree programs in health information management (HIM), and masters’ degree programs in health informatics and health information management. CAHIIM is important for anyone interested in becoming an HIM specialist. If you wish to obtain AHIMA’s Registered Health Information Administrator (RHIA) certification, you must have a bachelor’s degree from a CAHIIM-accredited HIM program. The National Association of Long Term Care Administrator Boards (NAB) accredits colleges and universities offering baccalaureate or graduate degrees in long term care administration. NAB accreditation is important if you are thinking about earning Nursing Home Administration licensure. In addition to receiving a high quality education, students of NAB-accredited schools score higher on the NHA exam. Find a NAB-accredited college or university. Licensure is not required for health administrators except for administrators of assisted living and nursing home facilities. Licenses are typically granted by a Board of Nursing Home Administrators in a state’s Department of Health. NAB provides tables of state-by-state licensure requirements for both the NHA and RC/AL licenses. American Association of Healthcare Administrative Management (AAHAM): Certifications for health care revenue cycle professionals. American College of Health Care Administrators (ACHCA): Certifications for long-term health care administrators. American College of Healthcare Executives (ACHE): Certifications for health care executives who lead hospitals, systems and other health care organizations. American Health Information Management Association (AHIMA): Certifications for professionals practicing health informatics and information management. Professional Association of Health Care Office Management (PAHCOM): Certifications for managers and administrators of health care practices (e.g. medical office managers). An associate or bachelor’s degree is the common baseline requirement, but higher qualifications may be needed for advanced certification. For example, the ACHE Fellow (FACHE®) credential specifies that applicants hold a master’s degree. For nursing home administrators, certification is voluntary and NHA licensure is mandatory. However, almost half of U.S. states recognize ACHCA’s Certification for Nursing Home Administrator (CNHA) as a “fast track” for NHA licensure eligibility.